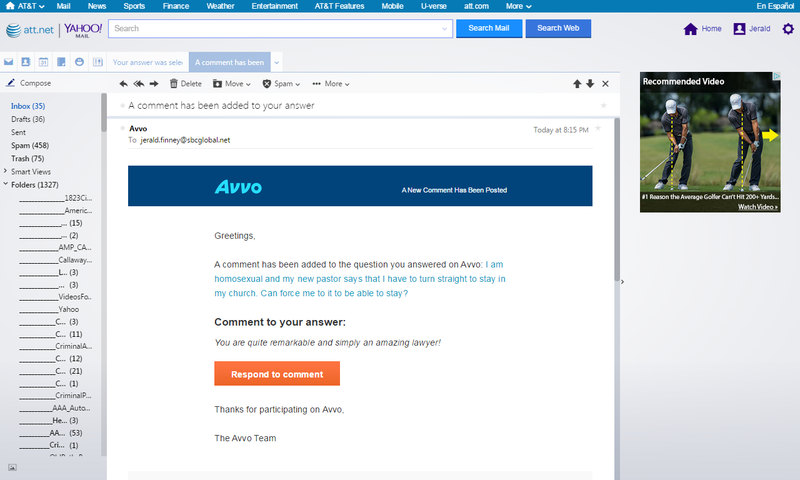 Legal question asked on AVVO on May 12, 2015 from one wanting to know why drawing a cartoon of Mohammed was not the same legally as yelling “Fire” in a crowded theatre with my reply and the reply of some other lawyers with whom I agree. The religion of Islam has entirely different principles about some matters than does the religion which was responsible for giving the United States freedom of religion, speech, assembly, press, and the right to petition the government for a redress of grievances. These freedoms are denied in many Muslim countries where Christians and others are persecuted and/or killed. Prior to the adoption of the Constitution and the First Amendment, all these freedoms were denied in most of the American colonies (as they had been in the Old World where Catholicism or some form of Protestantism combined with the state). 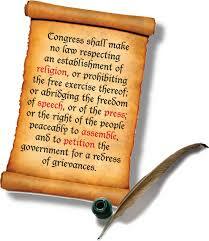 The First Amendment to the United States Constitution. Anytime religion and state unite, as proven by history, the result is the labeling of those who do not support and embrace the state/religion and “heretics” and their persecution and elimination. At least 50 million of such so-called “heretics” were murdered by the combination of church and state during the reign of Catholicism, and then by Protestant church state unions which adopted the church/state theology of the “mother” church (harlot). Those “heretics” believed in freedom of religion, freedom of conscience, and the other freedoms in the First Amendment. Their beliefs were based upon a literal interpretation of the Bible, not on the “spiritual” interpretations of the Catholic church which basically held that the Bible was open to interpretation by certain “spiritual” people (such as Origin, Augustine, and Thomas Aquinas). 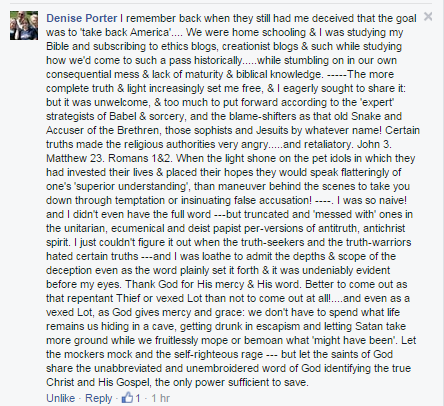 Those interpreters paganized and spiritualized, according to their preferences, the great truths of the Bible. As to the speech issue you mention, the teachings of Islam are fundamentally different from those of those Christian “heretics” who stood against the union of church and state and for freedom of speech, press, religion, and assembly and which resulted in the freedoms in the First Amendment. Many of the Moslems who live in America have brought with them their Muslim beliefs and wish those beliefs to be applied in America. In order for that to happen, American law would have to be fundamentally rewritten. A cross in a jar of urine is protected speech in America. Other odious depictions of Christ in movies, paintings, signs, etc. are common in America. As a believer, I detest those things, but I also believe in everyone’s right to the freedoms in the First Amendment. I don’t believe in killing anyone for their religious beliefs (as long as those beliefs do not result in murder, stealing, or some other crimes against one’s fellow man). The law protects, and rightfully so, those who express and practice their religious beliefs – even those who criticize other religions, religious leaders, etc. Answered May 14, 2014. Contrary to popular belief, yelling “fire” in a theater is not the most recent case law on clear and present danger. Schenck v. United States has been superceded by Brandenburg v. Ohio. Hate speech has also been approved as protected by the First Amendment (Virginia v. Black upheld a cross-burning). Hate speech is now akin to viewpoint discrimination. If the “hate group” was prohibited from having a drawing contest of Muhammed, then THEY would sue for violation of free speech rights. The Constitution doesn’t protect against people being upset. The Constitution protects the speaker’s rights. Yelling “fire” causes panic to a reasonable person. A reasonable person would not have some impulse to hurt or kill other people because their religion/beliefs/opinions are threatened. The fact that they approached the facility armed with weapons WITH THE INTENT of committing a crime against someone who was expressing free speech shows they were in the wrong. If you want this liberal/progressive defense of free speech that Pamela Gellar and company were engaging in, I suggest you watch some of the debates between supporters of Islam and with progressive TV host Bill Maher. Answered 28 minutes ago. Because it’s not illegal to “yell ‘fire’ in a crowded theater”; it’s “illegal to FALSELY yell ‘Fire!’ in a crowded theater”, which results in innocent people doing perfectly legal and reasonable things, and getting injured as a result. Mounting an armed attack against someone who makes fun of your religion is, in the United States, neither legal nor reasonable, and isn’t innocent; it’s a crime. Answered a day ago. 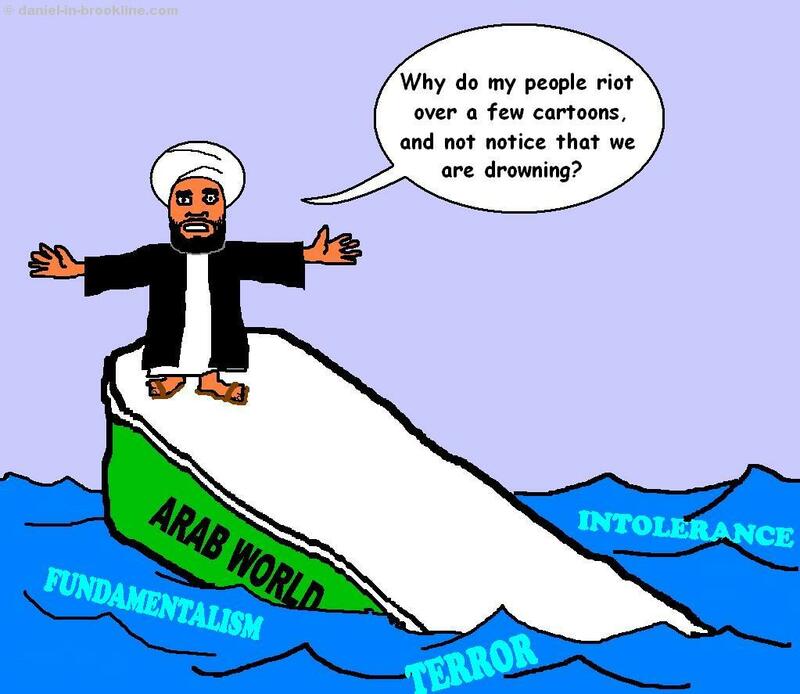 I think the big difference is that yelling “fire!” in a crowded theater will lead reasonable people to panic and potentially be injured, whereas drawing Mohammed will lead only criminals to react in a way that will cause injury. Click here to go directly to the AVVO page with the question below and all answers that were submitted. Speech in the public forum is protected by the First Amendment to the United States Constitution. This brief article first presents a question by a person who was planning to demonstrate in the public forum in America. The question was asked on AVVO, a website where people can ask legal questions and get online answers from attorneys. Following the question is my answer which the asker names as the best answer. At the end is the link to the AVVO page where one can see the question and answers from various attorneys, including my answer. “The First Amendment protects speech in the public forum. The First Amendment is the highest man-made law in America and only God’s law is higher. All lower laws (State, county, and city) are subject to the First Amendment. As you will see on some of the resources linked to below, even state constitutions, county and city ordinances usually reflect First Amendment rights. “Speech includes the spoken word and signs you carry. Depending upon the noise ordinance of the city, you may not be allowed to use amplification (such as a megaphone). “You cannot violate legitimate laws such as laws obstructing a highway, sidewalk or passageway, commit criminal trespass, etc., but the police may not use those laws to stop your legitimate speech. Some of the links below are to resources which tell you exactly what the Supreme Court has said about these matters. 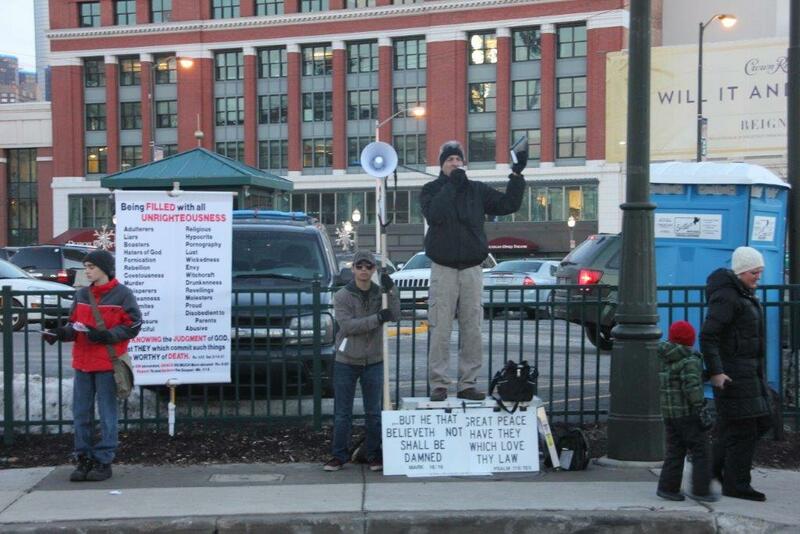 “https://opbcbibletrust.wordpress.com/contents/books/street-preaching-in-america-is-it-legal-tract/ (go there and click link). This goes over the hierarchy of law on this matter, including relevant Supreme Court caselaw. “I send you the above links because I don’t have room in this limited space to appraise you of your rights, how to deal with the police, etc. The resources will be very helpful to you. I have settled many problems where police try to interfere with or prevent speech in the public forum. “It is best to alert the appropriate law enforcement agencies, the city attorney, and maybe even the mayor and city council members before the date of your speech. E-mail them and/or send certified letters RRR. Call them beforehand. Let them know that you will be speaking in the forum and that your speech is protected. Let them know that should the police interfere with your speech, falsely arrest you, etc. that the individual police person(s) who violate your rights, the police department, the chief of police, the mayor, the city council members and the city can be sued for damages. Click here to go directly to the AVVO page with the above question and all answers that were submitted. 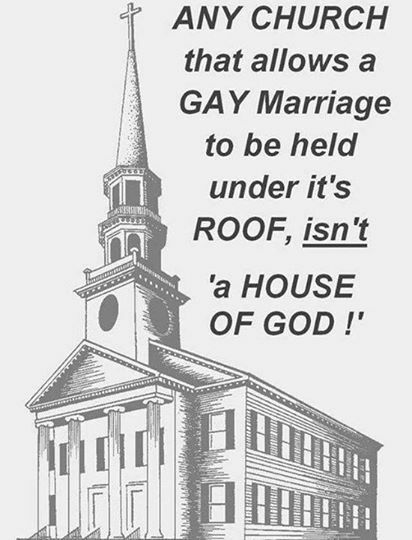 Can a church force a homosexual to turn straight to stay in the church? A church which is a legal entity (e.g. incorporated 501c3 church) grieves our Lord and is partially, at the least, under a head other than the Lord Jesus Christ. “I am homosexual and my new pastor says that I have to turn straight to stay in my church. Can force me to it to be able to stay? “I have gone to the same church for 11 years. I have never had a problem in my church even if I am openly gay and dress quite feminine. We have a new pastor since a year and he has tried to talk me into becoming straight since day one. Clearly, he is quite homophobic…. I have been able to laugh about if until now, but he is now trying to put pressure on my by the other pastors. “They have never had a problem with me before. Suddenly they want me to dress differently and “become straight”. “I am feeling harassed by my pastor and he even talked about me in church yesterday. It was clearly about me and I could feel the hostility. “One can read the history of the First Amendment at: https://opbcbibletrust.wordpress.com/contents/onl…. 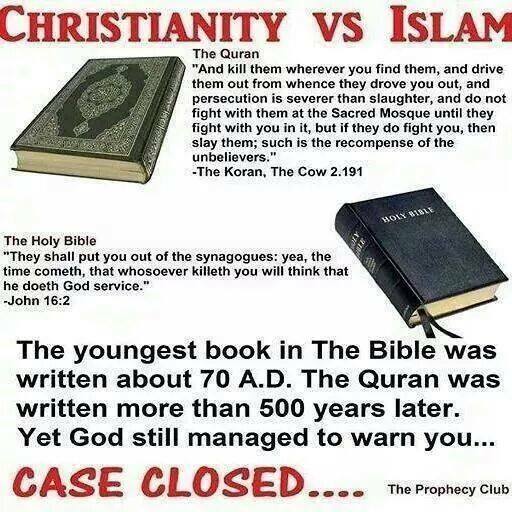 “An abbreviated version of that history is at: https://opbcbibletrust.wordpress.com/2010/01/06/a…. “I cannot fully answer your question in this forum, but I will give you an answer in a nutshell with additional resources for more detailed study. “If your church is totally under the First Amendment (has not become a legal entity by incorporating, getting Internal Revenue Code Section 501c3 or Section 508 status, etc. ), you have no legal recourse whatsoever against your church. “On the other hand, should your church be a legal entity, she has voluntarily taken herself, for many purposes, out from under First Amendment protections. For example, your church may be held in violation of the rule which says that the 501c3 religious organization shall not violate fundamental public policy. This rule was set in place by the IRS and upheld by the United States Supreme Court as to a religious organization – a religious school named Bob Jones University. The issue involving a church has not been dealt with. What the court would do in the church religious organization setting is not certain. However, I believe that the court should enforce the “against public policy” exception as to any religious organization. 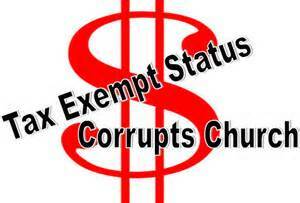 After all, if a church has voluntarily agreed to 501c3 status, she has agreed, as do religious schools, charitable trusts, Planned Parenthood, the Church of Wicca, and other organizations, to abide by the rules that go along with the status. The religious organization is getting benefits, so she should be willing to abide by the give and take contract she eagerly sought. There are many arguments one can make to support upholding the rules for all 501c3 organizations, not just select organizations. Click the above to go to online version of God Betrayed. “I don’t have the room to cover all the arguments, the law, etc. in this short space. This is all covered in much detail on the website, opbcbibletrust.wordpress.com. A link to the PDF of the comprehensive book on these matters is at https://opbcbibletrust.wordpress.com/contents/boo…. One can go to the index and look up Bob Jones University, and many other specific issues, or the Table of Contents to get general subjects such as incorporation, 501c3, etc. The online version has updates and is at: https://opbcbibletrust.wordpress.com/contents/boo…. The online version does not have an index. “To look at church legal entity status one can go online to https://opbcbibletrust.wordpress.com/contents/boo…. “The courts have not yet addressed the question of violation of fundamental public policy in the church (religious organization) context. As I said above, the courts have no jurisdiction over the purely spiritual church (the non-legal entity) church; such a church in America may still operate according to the principles in the Bible without civil government jurisdiction and persecution. To go the the webpage of the above question with answers from other attorneys, click here.